Admit it, at some point in this electronic era you’ve picked up a penny and wondered why they still exist. If nothing costs less than a dollar anyway, what good is a penny? A penny alone is virtually useless, but a hundred pennies can buy a delicious dollar item from your favorite fast food restaurant. Imagine if your child earned a hundred quarters in allowance. That would be $25 to buy that new toy they’ve been begging you for. Individual coins, unless rare and collectible, serve no purpose. But if you save every coin you find, the payoff of preventing their extinction will be worth every penny. If you’re on board with making an extra $50 just by saving your spare change, or you’re ready to teach your child the responsibility of earning what they want, you’re going to need secure storage for those earnings. Since the Middle Ages, piggy banks have been the most trusted way to save money, and with many new styles available today, they still are a popular and safe way to accumulate money. In the first decade of the twenty-first century, piggy banks were often used by parents as starter savings account for their children who earned money by completing chores. Piggy banks continue to serve that purpose for kids, and adults can implement the same principles of earning and saving by collecting spare change and storing it in these types of banks. The payoff a child experiences at the end of the week spending what they have earned is equivalent to the reward adults feel when they cash in the odds and ends coins they accumulated throughout the week. Whether your child is earning an allowance or you’re saving spare change, most of the funding will be metal coins, so you’ll need something durable and dependable to support the weight. Piggy banks are typically ceramic or porcelain which can withstand the weight of both coins and bills. And unlike the ceramic piggy banks created in the Middle Ages that had to be smashed to collect the money inside, modern piggy banks have an easily removable cork or require a PIN that makes the bank reusable time and time again. Piggy banks can be bought in-store or online at most major retailers. Prices vary depending on the store and method of purchase—for instance, online purchase usually require additional cost for shipping. Online sites such as Amazon.com feature these banks starting at a couple dollars, and offer more detailed styles for competitive prices. As with all purchases, you should contemplate what type of bank interests you before you shop around. Adults typically prefer the digital piggy banks whereas children may want a decorative, traditional bank. Listed below are ten banks you probably never knew existed. Piggy banks for adults, digital kids piggy banks, movie-themed piggy banks, elephant piggy banks and electronic piggy banks. For the lowest prices available on the items reviewed below, shop for them on Amazon.com. Any parent who pays at a self-checkout knows their child’s fascination with the ATM-style money feeder. This electronic bank features the same money feeder. You can deposit coins in the slot on the top of the bank. Entry to your savings requires a personalized four-digit PIN, which kids love typing in to open the bank like a safe. Select from a bright blue or sleek black design, or an adorable panda. This bank is also available in a yellow backdrop. The yellow design has blinking eyes and music that plays when you give the bank money. Kids love the design as much as they enjoy watching the bank eat the bills. This bank is a fun and engaging way to teach children how to save money. For all the cat lovers out there, this is the “kitty” bank for you. Instead of directly depositing money into this bank, a plush kitty will leap out of a square box and steal the money from a small platform where you place the coins. Kids love the element of surprise when the kitty pops out to swipe their coins. The kitty says “hello” before taking the money and “thank you” afterwards. This adorable kitty will have kids so entertained they won’t wait to add another coin to their collection. The bank holds about forty coins. Once the bank is full, you can access the money by removing the turning plug on the bottom. This kitty bank will be your child’s new favorite toy! A standard bank only teaches children how to save money. But spending is the best part of saving money, and the generosity of sharing money is just as rewarding. The Moonjar Classic Bank incorporates all three aspects to saving money. This multiple-award-winning bank features three deposit slots: save, spend and share. Each compartment is color-coded to match its purpose. Blue for saving, red for share, and green for spending. This bank is a great way to teach children how to manage their money. This kids bank also teaches that there are more opportunities for money than solely spending it on one’s self. Sharing or donating money is a great lesson to learn, and this bank can help teach that. This crowned princess bank is perfect for saving your baby princess’s first coins. The white ceramic pig wears pink baby socks to match the pinks of her ears and the Swarovski Crystals in her princess crown. The crown color and matching details are also available in princess purple. The classic bank style with the coin slot on the back allows for an easy deposit toward your baby’s future funds. Any parent will tell you it’s never too early to start saving for your child’s future, and the Swarovski with Crown piggy bank for kids is the prettiest way to be prepared. The hand-painted ceramic piggy bank is decorated with pink and green polka dots and topped off with a green satin bow on the head. The bank comes with a black dry erase marker for personalization. You can write either the child’s name or the date when the savings began. Kids love seeing their names on their bank. It makes the experience of saving their own money more personal. This bank has a slot for change on its back. Once the bank is full, you can remove the rubber stopper underneath and collect the savings. This precious bank is the perfect present for a girl’s baby shower or birthday. Parents know that owning fragile glass or ceramic keepsakes is risky in a house with small children. The Child to Cherish Ceramic Bank is made of high-quality ceramic so you can cherish the piggy for years to come. This traditional bank style allows you to collect coins through the slot on the back and withdraw it by removing the rubber plug on the pig’s belly. Available in seventeen different designs—including such designs as a princess, ballerina, baby birdie or ladybug—this bank is sure to satisfy any little girl. If you don’t like surprises and want to know the amount of your savings before you cash in, this digital coin counter is your ideal bank. The glow in the dark bank is an awesome decorative feature for any room. A standard version is also available. Both versions are cool piggy banks. At the end of the day, you can empty your pockets into this electronic coin counter and watch your savings increase. Kids love seeing the numbers change when they deposit their coins. The digital LCD screen automatically tracks your savings. To access your money, simply unscrew the lid. This coin counter accepts all U.S. coin currency including half dollars and dollar coins. To add dollar bills, select the + button on the lid to adjust the total. When you remove money, adjust the total with the – button. The perfect bank for both children and adults. The Money Savvy Pig teaches children how to save money, donate money, spend money and invest their money. With four separate deposit slots, this kids bank allows children to divide their money into each category. This award-winning bank teaches children the reward of doing more with their money than spend it. The transparent purple design makes it easy for children to see their savings grow. When each compartment is full, you can empty them individually and use the savings according to the save, spend, donate, or invest category. This piggy bank for kids is a great tool in teaching money management. In this electronic age, an electronic piggy bank only seems appropriate. The Wiggy Piggy is an interactive bank app that you can download on iOS and Android compatible devices. 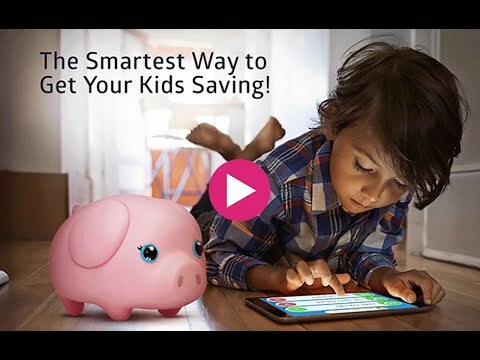 This kids piggy bank allows parents to set tasks for their children to complete. Once each task is complete, the child gets to check them off on the app and receive their reward in either stars or money. This bank package includes the Wiggy Piggy toy, the free app, a Wiggy crate and instructions for the bank. The Wiggy Piggy toy—offered in colors such as pinky, ice cream or sky—informs the child of their new task and their progress for motivation. This bank system is an excellent way for children to “Learn to Earn”. Calling all Star Wars fans! This piggy bank for adults is a hand-painted replica of BB-8 from Star Wars: The Force Awakens. This bank will make the perfect addition to your Star Wars collection. Decorate your home or office with this collectible bank, and you’re guaranteed to induce envy in Star Wars enthusiasts. The BPA-free ceramic makes the bank easy to clean by hand or be dusted, so the collectible item will always remain in outstanding condition. This bank is also available in characters such as R2-D2, a classic Stormtrooper, or Captain Phasma. All these cool piggy banks are hand-painted in breathtaking detail and all guarantee that your coins are safe. Saving money is typically something you do in a federally insured account. Unless you’re seven years old and saving your allowance, or you’re an adult avoiding the mundane visit to the bank daily to deposit spare change. Piggy banks are the most trusted method of saving money. And with their availability in an assortment of styles, they’re appropriate for all ages. So what good is a penny in today’s time? On its own, still nothing. As part of a collection of other pennies, it could mean a reward. But collection or not, your coin savings are still invaluable without the safe storage of a piggy bank. Lopeg - Piggy Banks & More | All Rights Reserved.